Take advantage of free shipping from MusicFactoryDirect.com. Click link to get started. 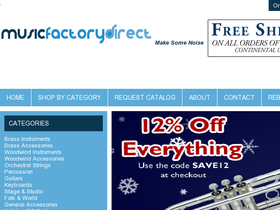 Use this coupon code to get $10 off your order of $100 or more from MusicFactoryDirect.com. Click link to see code and save. Check out MusicFactoryDirect.com's Clearance Sale section, and save up to 75% on a wide variety of high quality instruments. MusicFactoryDirect.com has the highest quality instruments for 40-50% less than anywhere else! Click link to see deals and start shopping. Visit Music Factory Direct and buy a drum set to get free giveaways with your purchase. Click link and shop today. For a limited time buy one, get another free from Music Factory Direct when you purchase a Yamaha instruments. Follow this link to get started.